I've always been intrigued by fennel, because I really like licorice (and ouzo). I could probably devour the whole bulb plain- the texture is like celery, and fun to crunch on for a snack- but I was eager to seek out a recipe. 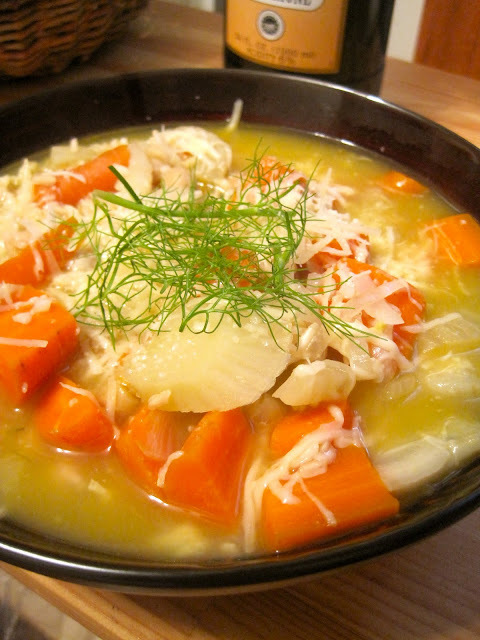 101 Cookbooks is always my first go-to for all dishes veggie, and where i stumbled across Carrot and Fennel Soup. Simple, elegant and tasty, this easy soup was definitely hit. Carrots and fennel give the soup an earthy feel, and a hearty serving of rice texturizes the dish. Lastly, the soup is topped with tons of shaved Parmesan, which you just can't go wrong with in a vegetable-broth based soup. Fennel is actually a member of the Apiaceae family, and closely related to carrot, parsley, cumin, and dill. During the Middle Ages it was hung over doorways to drive away evil spirits. It's up to you if you want to give that a try or not. Fennel also is very nutritious. A unique combination of phytonutrients give way to strong antioxidant activity, plus an excellent source of vitamin C.
"Specialty Crops: Fennel." Sustainable Farming Project. Tufts University. Web. 9 Aug. 2011. <http://nesfp.nutrition.tufts.edu/ethnic_crops/vegetable_details.php?veggieid=30>.